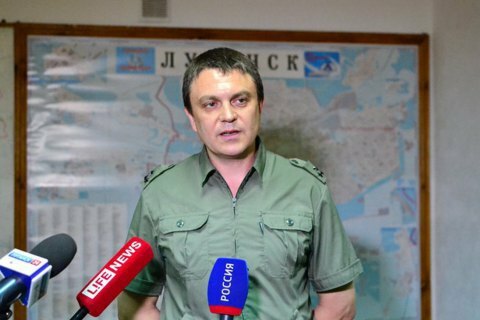 The head of the self-proclaimed Luhansk People's Republic (LPR), Ihor Plotnytskyy, has tendered his resignation, LPR state security minister Leonid Pasichnyk has said. According to the separatist Luhansk Information Centre website, Pasichnyk declared himself acting head of the LPR. "Ihor Venedyktovych Plotnytskyy resigned for health reasons today. Numerous combat wounds, consequences of concussion took their toll. In line with his decision, I'm stepping in as acting head of the republic until the next election," Pasichnyk said. Plotnytskyy was appointed "the LPR envoy" on the implementation of the Minsk agreements on the Donbas settlement. On 21 November, LPR interior minister Ihor Kornet, who was dismissed by Plotnytskyy, refused to obey and published a video address in which he accused some senior LPR officials, including those from Plotnytskyy's close entourage, of working for Ukrainian special services. The same evening dozens of military vehicles came to Luhansk from Donetsk. The state security ministry of the self-proclaimed Donetsk People's Republic (DPR) said that it was holding a special operation together with LPR militants against "Ukrainian saboteurs". Plotnytskyy's people were detained. On 23 November, Kornet said that his militarized response prevented the LPR from returning to Ukraine. The same day Plotnytskyy reportedly left Luhansk. Later he was spotted in Moscow.